With the Indian national polls for the Lok Sabha fast approaching – beginning on April 11, the largest democratic election in the world, the opposition Congress Party has issued its manifesto with a key pledge to bring a rural employment guarantee programme and reward businesses for creating jobs, if it wins the general election. An important feature is scrapping of the Sedition Law coming down from the colonial days, introduced in 1870, which has been used by post-Independence governments to bring legal action against opposition forces. Congress leader Rahul Gandhi said the manifesto highlighted job creation, tackling farm distress and empowerment of women as some of its top priorities, adding that “The main issues in the country today are unemployment and farmer distress”, and “the economy is jammed, and everyone agrees that India's economy is stuck, so that needs to be restarted.” This includes the NYAY – Minimum Income Support Scheme recently announced to remove poverty. The main opposition party would expand a current existing jobs programme to guarantee 150 days of work a year to rural households, up from 100 days, and promised to simplify a goods and services tax, quickly fill 2.2 million government jobs nationwide, create one million more on rural and urban development panels, and reward businesses for employment generation. It seeks to bring unemployment down to 3 percent and more than halve the unemployed in five years. The manifesto proposes two big changes to how parliament would work, recommending the strengthening of the Anti-Defection Law, which was put in place to prevent lawmakers from moving between parties. It calls for “instant disqualification” for a period of two years for proven disobedience to a party whip, and calls for a mandatory public consultation before a Bill is introduced in Parliament. A key proposal is that of removing the Sedition Law coming down from colonial days, which carries a maximum penalty of life imprisonment, which the Congress sees as necessary for the spread of free speech, and in the context of it being used recently against student protesters against the Modi government, and the Kashmir situation. A major controversial feature of the Congress manifesto are amendments to the controversial Armed Forces (Special Provisions) Act – AFSPA – that gives special powers to the Indian Armed Forces in insurgency hit areas. It seeks to strike a balance between powers of the Security Forces and the human rights of citizens, and also remove immunity for enforced disappearances, sexual violence, and torture. The Congress manifesto has come for strong criticism from the ruling BJP forces of Narendra Modi. Although Congress won three state elections last year amidst distress among farmers and the prevailing employment shortage, it consistently trails Prime Minister Modi’s Hindu nationalist BJP, with its support from the Hindutva movement. The BJP is bringing out strong criticism of the moves to remove the Sedition Law and bring changes to the AFSPA, presenting the conditions in Kashmir, in the current post-Pakistani attack earlier this year, and the need to have stronger moves against insurgents and supporters of terrorists. 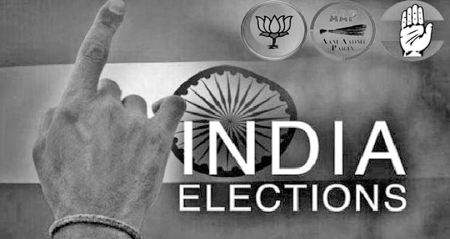 The Indian polls campaign moves to its highest pitch in the coming days, with increasing developments on caste and creed as the political competition gets tougher, and the BJP and its Hindutva supporters pushing strongly for majoritarian Hindu strategies in the politics of the country. While the United Kingdom moves closer to a General Election, the UK’s Labour Party led by Jeremy Corbyn has been drawn into the prevailing political chaos on Brexit, with Theresa May calling for help from the Opposition Labour Party. This follows her failure to obtain support from her Cabinet and the House of Commons for her Agreement with the European Union (EU) over the UK’s exit from the EU. 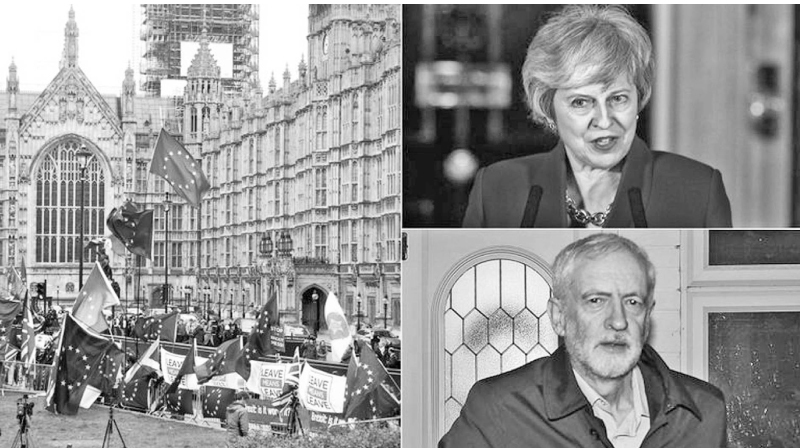 The situation of non-agreement over major issues on the UK leaving the EU, has brought the UK to a major political crisis, with increasing divisions within the ruling Conservative Party (Tories) and the Labour Party, too. Theresa May is now on her way out of the leadership of the Conservative Party, but she continues to keep pushing for an adoption of her Brexit Agreement with the EU, that has been voted against thrice in the Commons, by large, but reducing numbers. Labour leader Jeremy Corbyn is being pressed by increasing members of his party to demand a second referendum on the Brexit moves, as a condition for any deal struck with Theresa May in the current context. Corbyn has been calling for separate trade arrangements with the EU once the exit from it takes place, and also for moves to safeguard the rights of UK workers after the exit. Theresa May has so far not been agreeable to any serious amendments to her own proposals and she has emerged with major failure in the period of nearly three years since the move to leave the EU began. In calling for a surprise General Election held two years ago, she wanted to secure a bigger mandate for her own Brexit vision – although one who opposed Brexit in the referendum campaign for it – and led the Tories to lose its majority in the Commons. Instead of seeking an understanding with the Opposition over the Brexit moves, she came to a parliamentary voting understanding with the Northern Ireland’s Democratic Unionist Party (DUP) to keep her majority in the Commons with the DUPs ten seats in the House. She has consistently moved without any agreements or understandings with the Opposition parties, while seeing increased divisions within her own party on Brexit. Political analysts think that every parliamentary defeat on her deal since it was signed with Brussels four months ago, and the ongoing stalemate in the Commons is due to her disastrous decision to hold an election and the resultant hung parliament result. The political situation in the UK is so confusing with increasing questions on governance, and a rise in betting at bookies on a coming general election. Many Labour MPs see Theresa May’s call to Labour for talks to “bail her out” after she failed to pass her own deal through the Commons. They think any guarantees she gives will not be watertight and could be overturned by a future Conservative leader, which puts Jeremy Corbyn into much difficulty in the current context. They see the best solution being the call for the public to have a final say on any deal on Brexit, which is agreed by parliament, which they see as the only way to safeguard Labour’s reputation with its national membership following any understanding with Theresa May. As this is written (Thursday 4) the May and Corbyn discussions have been described as ‘constructive’. The ‘Guardian’ reported a Labour spokesman stating: “We have had constructive exploratory discussions about how to break the Brexit deadlock,” and agreed on a programme of work between our teams to explore the scope for agreement, and that an emergency shadow cabinet meeting was convened in the aftermath of the discussions to consider how Labour should proceed. After several weeks of mass and peaceful protests by the people, with several millions, especially youth and women, and including families involved, Algeria is moving towards a new political era following President Abdelaziz Bouteflika announcing his resignation, after 20 years in office. Bouteflika was a key figure in the struggle to liberate Algeria from colonial power France in the 1950s. He was widely credited with helping to end the crippling civil war – which pitted the Algerian army against Islamist insurgents – that killed some 200,000 people in the 1990s. However, Bouteflika has been largely out of sight since he suffered a stroke in 2013 that confined him to a wheelchair and severely impaired his speech. Since then the Algerian government has been managed by a group of Bouteflika’s family members and close associates, with the Army, in the largely oil rich country, with little room for democracy. The protests in the past week have shown a strong demand for democracy and the rising strength and thinking of a population that is nearly half below 35 years of age. As the protests against Bouteflika kept growing he withdrew his move to seek election for a fifth term as president, and postponed the date for election, earlier scheduled for April 2019. The public was not ready to accept his retention in the ranks of the government, and called for his resignation. A few days before his resignation announcement this week, the Army announced he was not suitable to hold office under the Constitution. However, this too was not acceptable to the public that wanted a complete change in the power structure in the country. In a farewell statement on Wednesday, Bouteflika asked “forgiveness” of those whom he had inadvertently “failed in my duty despite my deep commitment to serve all Algerians, without distinction or exclusivity”. He further said, he hoped that the nation would continue to work towards “horizons of progress and prosperity by granting … special attention to young people and women to enable them to access political, parliamentary and administrative functions”. As they celebrated Bouteflika’s resignation in the streets of Algiers on Tuesday, flag-waving Algerians vowed to keep protesting to demand sweeping change to the country’s political system. Political analysts see that Bouteflika’s resignation is not enough in the current political context, as the people, especially the youth, seek full freedom, and are ready to protest as ‘long as necessary’. Under Algeria’s constitution, the speaker of the upper house of parliament, Abdelkader Bensalah (76), is due to take over as interim leader for 90 days while a presidential election is organised. He is a member of the National Rally for Democracy (RND) - a party closely allied to Bouteflika’s National Liberation Front (FLN), the leading organisation in Algeria’s freedom movement.